This car is going to be at the Performance Racing Industry 2007 show in December. Butler Performance and AllPontiac donated the Block and Heads for this project. 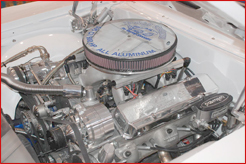 The engine was built in house with Butler Performance selecting internals and supplying Butler Performance Valley Pan, Oil pan, EVAC System, Valve covers and unlimited expertise! Hello all, My name is Frank From Prodigy Customs. 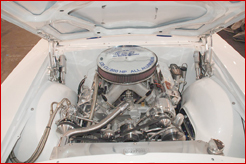 We specialize in Pro Touring GM cars, mostly Chevrolet and Pontiacs from the 50s through 80s, with most of our projects falling in the late 60s to early 70s vintage. 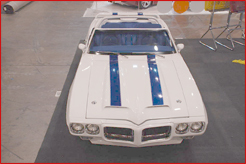 We are long time Pontiac fans, in fact my first new car was a 78 Trans Am when I was a senior in high school in 1978. While the majority of our work is Chevrolet based, I have owned and built dozens of Pontiacs over the 25+ years I have been building cars. I will post some pics of other recent Pontiac projects later. The following is a little project we debut at SEMA last week and seemed to really get the true Pontiac fans blood flowing. 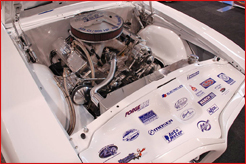 At the urging of a few Performance Years members which attended SEMA, we are posting some pictures and information here. I hope you all like it. Project EmptyNest as it is tribute to the infamous 1969 Trans Am convertible of which of coarse only 8 were built Prodigy style. This 96 day project started in mid July with a 67,000 mile rust bucket. Project EmptyNest was built for and by my wife Lisa. When I met Lisa 23 years ago, she had totaled her 66 mustang Street Racing, and came to me to build her another with the insurance proceeds form the totaled mint Pony. Long story short, I blackmailed her into going out with me under threat her paint job may not be as good if she were not my girlfriend, and 23 years later, I still find ways to keep her, LOL! The premise behind the project is that Lisa had to put her muscle car days on hold when we had too many kids (3 boys) to fit in her sports cars, and now that the kids are grown, and now that Michael our youngest is a accomplished car builder, it is her turn. 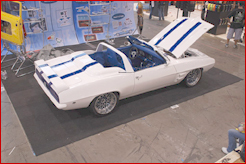 After fully supporting and watching father and sons dream of Michael's first car, a 67 Camaro convertible named Project Prodigy, being a SEMA show stopper, it was only fitting that Michael build a hot rod for mom since it was his birth making 3 babies, One too many to fit in a 2 + 2 anymore, forcing her to give up her hot rod! Lisa very much wanted to participate in the project, do a few things, learn a few things, she did not want this car just handed to her. Lisa got down and dirty right there with us. Lisa is a girlie girl, just the way I like them, but she is not afraid of much including torches, plasma cutters, welders, grinders, saws, she did it all! Michael and myself did the lions share of the work, with a lot of help from our awesome staff at Prodigy Customs, and some really good friends that all busted their asses.